Pancakes were one of the first things that I tried to make gluten free. They were also one of the first major disappointments I had in cooking gluten free. I just could not get them right. My family has eaten pancakes almost every Saturday for years. We started this when my husband and I were first married, and we have continued the tradition. Pancakes were something that I knew I must figure out, but it was a challenge. The first few batches that I made were from blends that contained rice flours. The pancakes were just wrong. The texture was off and they took forever to get done. 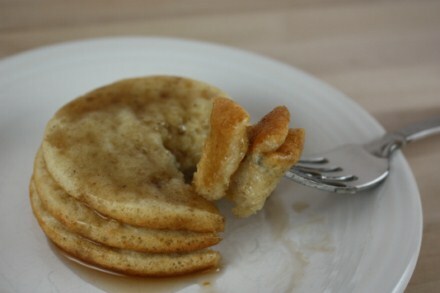 Then I started trying pancakes recipes that were from gluten free cookbooks. They were also a big disappointment. They were thick, would not get done, and most had the odd taste that gluten free things sometimes have. I was not about to give up. I knew I must conquer pancakes. I wanted so bad to find something that my family could enjoy. I wanted it to be close to the pancakes that we had enjoyed for years. It was at this point that I really started to look into the science behind gluten free cooking. I started realizing why some recipes call for certain gluten free flours and others did not. What works for one recipe, may not work for something else. I kept reading about the wonders of sorghum and what it did for gluten free cooking. I was very intrigued with it. Not only that, I started to realize the health benefits of sorghum as opposed to using some of the other gluten free flours. I decided to give sorghum a try. The first pancakes that I made using sorghum were a hit. After taking a bite, my husband said, “You finally figured it out, these are as good as the ones that you used to make.” I was thrilled. I finally had good gluten free pancakes. I figured out that sorghum flour was the trick to getting pancakes that my family would love. This is the recipe I have been using to make my mini oven pancakes, but I also love it for regular pancakes. Mix together sorghum flour, potato starch, tapioca flour, xanthan gum, baking powder, baking soda, salt, and sugar. Add remaining ingredients and whisk to combine. Whisk just until combined and let sit for 5 minutes. I would love to try this recipe – how many pancakes does this make as I may need to make only a half batch. Thanks! I 1 1/2 this for my family of 5. Doubling is a little too much, but a single recipe is not quite enough. I would suggest for just 2 people that you 1/2 it. I hope that helps answer your question. I’m definitely going to have to try this. I’ve been missing pancakes! .-= Jenni´s last blog ..fight modern-day slavery =-. Glad you found a pancake recipe that works. I have three or four gluten free ones now that I like and they look completely different from your ingredients. It’s good to know there are several ways to do be successful with gluten free cooking. Personally, I think a lot of the gluten free pancake and waffle recipes use too much xanthan gum when they really need more baking powder. .-= flora´s last blog ..Easy Gluten Free Strawberry Shortcake =-. You might try rice flour, although I am not sure it would have the same texture. I think it would be worth trying. Maybe just make a small batch and see how it turns out. And wow corn and potatoes on top of gluten that would be really hard since a lot of recipes call for them. Do you have any advice on substituting for buttermilk? My husband is gluten-free but my daughter can’t have milk products. They all love pancakes and I’ve been hard pressed to find something enjoyable to all. We use almond milk in recipes calling for regular milk but I don’t know what to do about buttermilk. I assume there is a reason for it to be in the recipe besides adding liquid. Thank you! I will hook up with your FB page. I made it VEGAN and sugar free and it turned out delicious. I used nut creamer (instead of the buttermilk) and egg replacer and instead of sugar i put 1/2 teaspoon of salt. They were not savory but flavorful and the sorghum definitely does the job! Thanks! Just made these and the taste was delicious but they turned out really thin – more like crepes. Any idea what I’m doing wrong? The gluten free pancakes I have made do tend to be a bit thinner than regular pancakes, but I have not had trouble with these being crepe like. We enjoyed these yesterday for breakfast in fact. In other recipes I have had varying results with different brands of tapioca flour/starch, so that may have changed it some. If you liked the taste, I would say just cut back a little on the liquid next time. I hope that helps. This is a delicious recipie! I made it VEGAN and sugar free and it turned out delicious. I used nut creamer (instead of the buttermilk) and egg replacer and instead of sugar i put 1/2 teaspoon of salt. They were not savory but flavorful and the sorghum definitely does the job! Thanks! Thanks! I am glad that you enjoyed them and they it worked to make them vegan. I just mixed up the batter and it is incredibly thin. I am pretty sure that I followed the instructions perfectly but it is so thin, I don’t think I can make pancakes- they would just spread into each other. You mentioned in another response to a question that the batter is thin but how thin? Surely I did something wrong for it to be so thin and liquidy?